supplies: paper- crate paper, neenah, amuse studio; ink-memento and archival brilliance; stamps- amuse studio and art&co; dies-spellbinders and art and co.; ribbon- walmart, amuse studio and my stash. I stamped on top of the pattern music paper. I really like how it turned out! I am entering this in the stars and stripes challenge over at Dies R Us. Great job Sandi! Love the addition of the tag ... I never think to use tags (or make them for that matter! LOL) Thanks so much for playing in our ‘STARS & STRIPES’ challenge at Dies R Us! Please come back again soon! LOVE this patriotic card!! Fabulous stamping!! 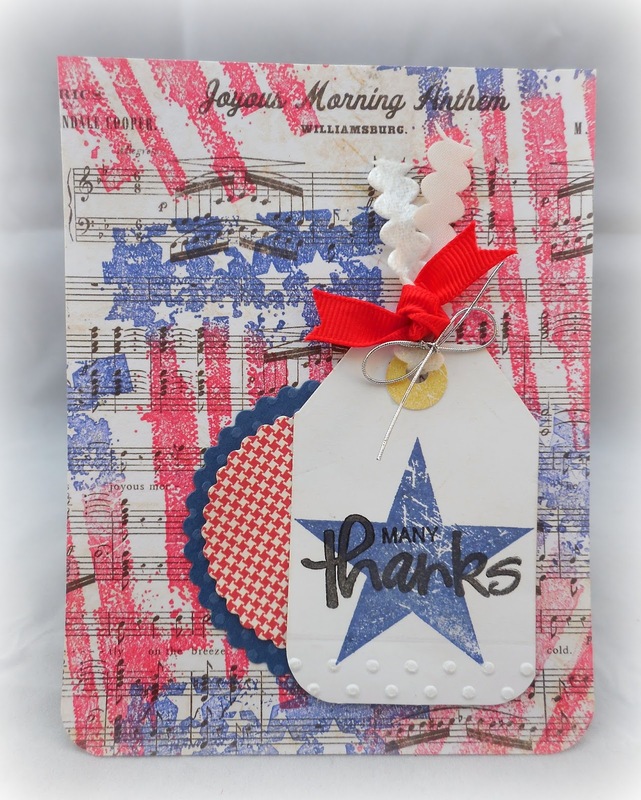 Great patriotic card!! I like the design and the added tag. Great stamping too! Thanks for joining the Brown Sugar Challenge. This is so cute! Love the embossing on the bottom of the tag! So creative! Thanks for joining us at Dies R Us!